This candidate is the ONLY gubernatorial candidate that took time out of his busy schedule to private IM me this morning on some questions I had. This tells me he is a governor for the people and will LISTEN. There are certain issues that I firmly believe in and he answered each of those issues with certainty and honesty. He is a true conservative, not some RINO. Vote for Andrew Thomas!!! Hubby and I have mailed in our ballots with Andrew Thomas for our governor. Andrew Thomas put his career on the line for his constituents who wanted something done about corruption. He did the job we elected him to do without hesitation and with great courage and strength. There isn't another candidate for governor that has proven himself more to Arizona voters. A vote for Ducey is a vote for the establishment GOP and McCain. A vote for Jones INC. is a vote for a blatant corporate brand. A vote for Bennett is a vote for weakness. A vote for Smith is a vote for the liberals. A vote for Riggs is a vote for an unproven outsider. Save and protect Arizona... VOTE ANDREW THOMAS FOR GOVERNOR! If you believe in Andrew then he's good enough for me! I'm voting for him to! I havent even left the garage yet! — feeling excited. Now there's an endorsement to have! Malkin is one of the best activists for conservatism in the country. She doesn't just grab headlines, she knows the issues and she's in the trenches with us fighting them. Love what she does on Twitter. Thank you for running a "no-strings-attached campaign. I would dread anyone owing McCain favors. His progressive politics and mine don't mix. But WHO is telling us Thomas can't win? Pollsters? Who's interests do they have? Do you really think the Republic would print a poll that shows Thomas in the lead? The surge is on, the TV ads and enthusiasm is growing. The establishment has identified it's candidate the grassroots needs to do the same. Thomas for Governor ! Vote Andrew Thomas for Governer of Arizona at the primary and general election. I have met him personally and he is dedicated to what we want from our Governer. Hey fellow Arizonians , if you haven't already filled out your primary ballots, please consider voting Andrew Thomas for Governor... I know I am personally tired of these socialist loving Democrats and these sorry, wishy washy, progressive Republicans. What we NEED is a true conservative that'll do what he says and Andrew Thomas is that guy. I love supporting a candidate and a campaign that I believe is working for the good of this great country and not for their own personal gain. Right now, more than ever, Arizona needs a strong leader. There is only one person that is qualified to do the job. Andrew Thomas is tough, resilient, experienced and brilliant. Andrew Thomas has earned my trust, respect and of course, my vote. I am done with republicans and their progressive ways, we NEED a true conservative like Andrew Thomas to take the reigns and lead us out of this mess !!! Everyone! 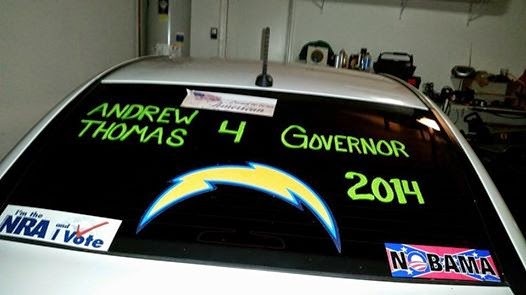 I'm extremely excited to see that Andrew Thomas is running for Governor for our Great State of Arizona. In the days we live in where compromise abounds I find it more than comforting and encouraging that this man does not compromise with social and media norms and that he is clearly transparent with the only agenda of making our State and America a much better society where we the people can again trust our leaders in government in doing what is right regardless of any pressures from anyone. Andrew's track record speaks for itself. I will sleep much better at night once Andrew is in Office knowing that the citizens of Arizona, our children and grandchildren have hope in a brighter future!! I'm filling out my early ballot today with a nice black arrow pointing at Andrew Thomas! God bless All!